Please join your fellow Saint Anselm Alumni for an evening of MEMORIES , FRIENDSHIPS and ANNIVERSARIES. We salute the Classes of the 9’s. 1949-1959-1969-1979-1989-1999-2009 ( ALL ALUMNI , FAMILY,FRIENDS,and VOLUNTEERS are Cordially Invited to JOIN the CELEBRATION. ENCOURAGE YOUR FRIENDS. We also SALUTE our ACTIVITY and SPORTS PROGRAMS. Send us some memorable PHOTOS. SACA.ALUMNI@GMAIL.COM Bring some to share. RAFFLES – 50/50 - SURPRISE SALE Please join us for our COMPLIMENTARY Social. Come share your MEMORIES. As always ACADEMY DONATIONS would be greatly appreciated. 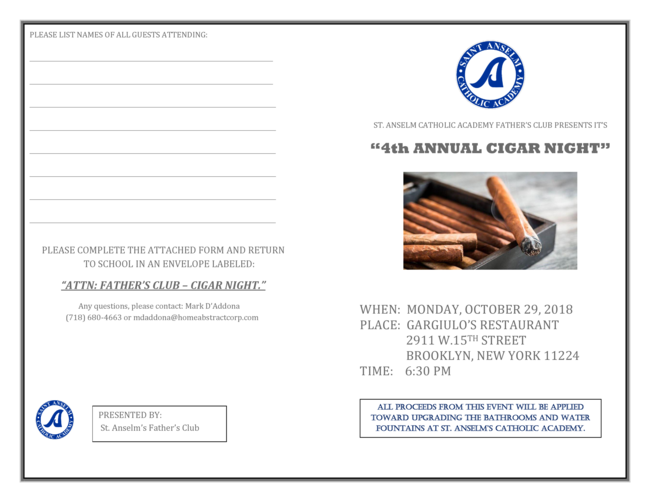 RSVP:SACA.ALUMNI@GMAIL.COM or CALL 347-853-4246 John Thomas. SAVE THE DATE : Saturday April 6th. 6 to 9pm. ALUMNI SOCIAL. Details to follow. On December 18th, a very special group of St. Anselm Catholic Academy teachers and children from PreK 3, Kindergarten, 1st and 2nd grades joined Principal Kevin Flanagan to donate boxes filled with children’s toiletries and accessories to their less fortunate peers in shelters run by Safe Horizon, an organization that provides a secure, nurturing space for victims of domestic violence. The annual event, which began as a conversation among mothers looking to help their children learn to share what they have with those in need, provides extra special stocking stuffers for the approximately 400 children who are currently in the 8 shelters run by Safe Horizon. 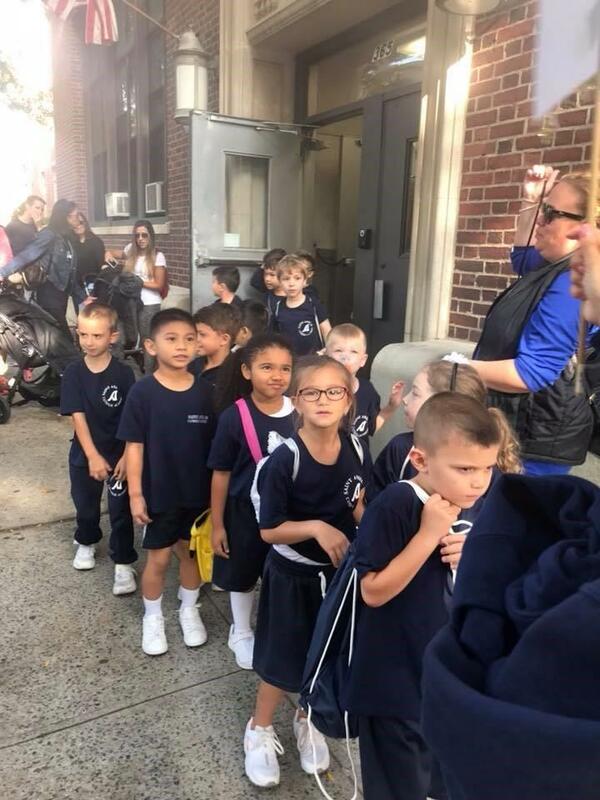 Hats off to the young community helpers and their families for their donations and a special thanks to the SACA teachers and Principal Flanagan for coordinating this event. Christmas Card Joy for Patients at Calvary Hospital , Brooklyn. Thanks to our students and teachers. 5th. Grade students from Ms. Mitchell (homeroom) and Ms. Beatrice (religion) class used their creative talents to make cards (35) to brighten the spirits of patients in need of some JOY. The cards were displayed in both the patient rooms and common areas of the hospital and well received by all. Calvary staff was very pleased with the project and sent the class some thank you pens and cute animal squeeze toys. The plan is to expand the program for other meaningful holidays throughout the year. Thanks to our principal Mr. Flanagan for helping to coordinate. Please visit our Academy website. We have added an online DONATION feature. PLEASE HELP SUPPORT our academy. 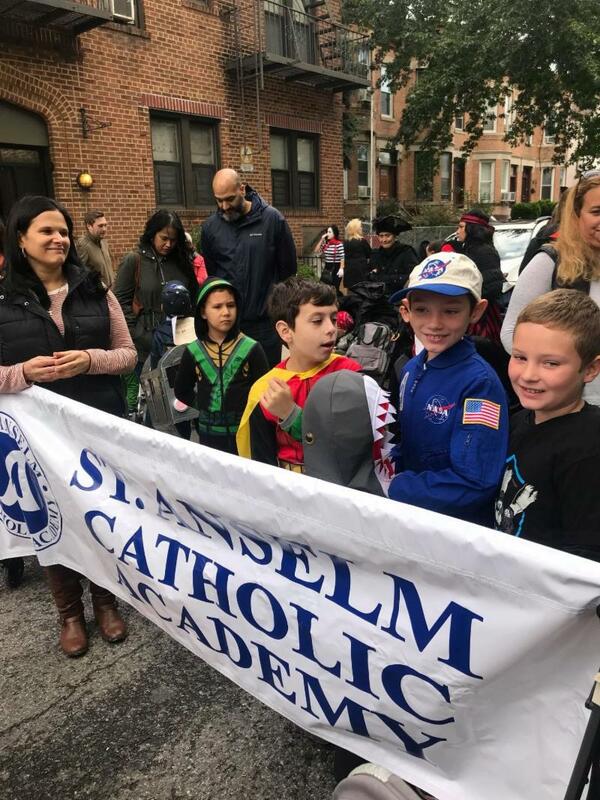 The Parish Publicity Committee of St. Anselm sends out a calendar of parish events monthly and information about special events occasionally throughout the year. If you would like to be placed on the parish contact list please email the Parish Publicity Committee of St. Anselm - Robert Kassenbrock and Eileen Loughlin ppcst.anselm@gmail.com. Interested in a part time Development/Marketing Position at our Academy Please see the job posting on INDEED.COM. ALUMNI SOCIAL . Details to follow. 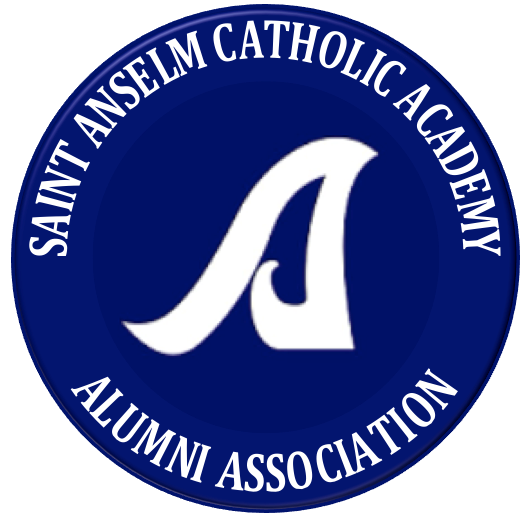 Greetings from Saint Anselm Catholic Academy Alumni Association. My name is Kevin Flanagan and I’m delighted to be serving as the new Principal of this historic school. 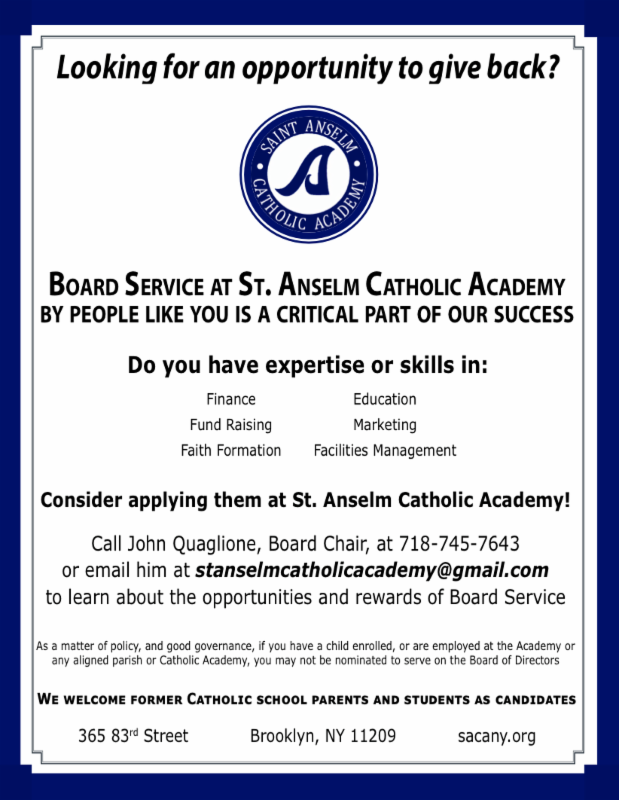 As an experienced educator, I join Saint Anselm Catholic Academy after working in both Catholic and Public schools in a variety of positions. 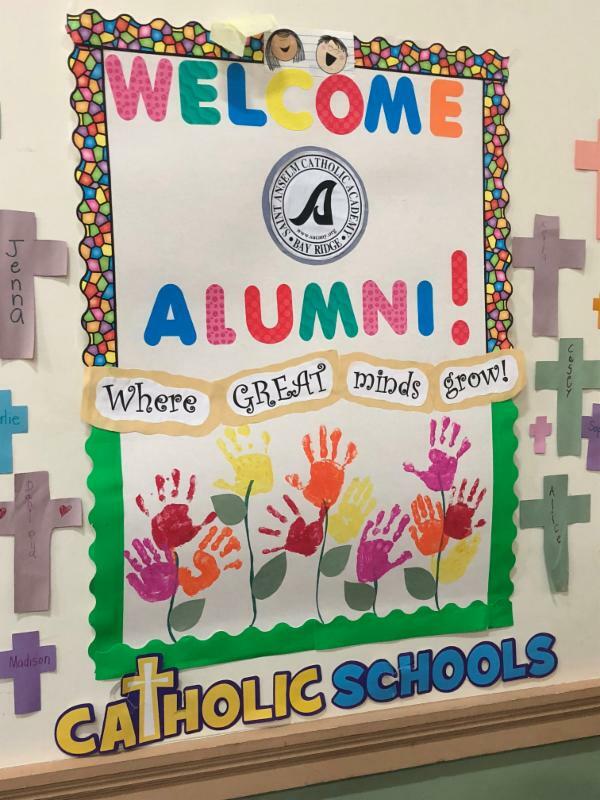 I began my career at St. Agnes School, teaching Middle School Social Studies and Religion, until the school closed due to low enrollment. I then transitioned to Dorchester School where I taught the Gifted and Talented program and created a G&T Math program. After earning my Master’s Degree in Educational Leadership from Montclair State University, I became an Instructional Coach at 4 schools in Pequannock Township. In that role, I worked with teachers to improve their instruction and to implement the Next Generation Science Standards a year ahead of schedule. I’m licensed as a teacher of Elementary School, Middle School Science and Social Studies, Supervisor, Principal, and Superintendent. I must say, the most interesting part of my new job might be familiar to many of you even today, the school building itself. During my first month on the job, I can honestly say I “discovered” rooms I didn’t even know existed! Remember the shower rooms that were in the 3 rd floor bathrooms? How about the tunnels that connect the church and the school? Did you realize there was a super-secret room hidden behind what looks like a regular coat closet? Long story short, the history in this building is amazing and it’s something that bonds you and the students currently enrolled. I am glad to know there are graduates out there who care enough about this great institution that they still want to see us succeed. As a thank you, if you would ever like a tour of the building, feel free to call or email us and we would be happy to accommodate you. 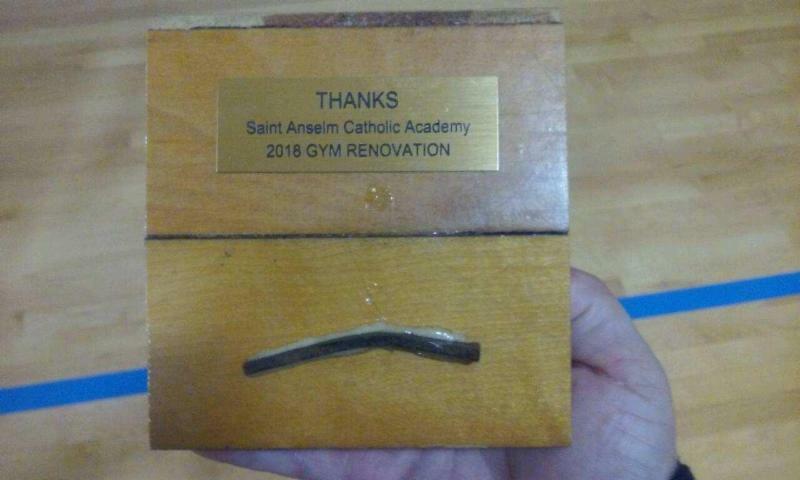 We also wish to THANK , Mr. James McKeon for his tenure as Principal. He was instrumental is bringing the UPK program to our school. Please enjoy your RETIREMENT !!! We are pleased that the total Academy enrollment has again increased to 341 students. This includes 66 UPK children. 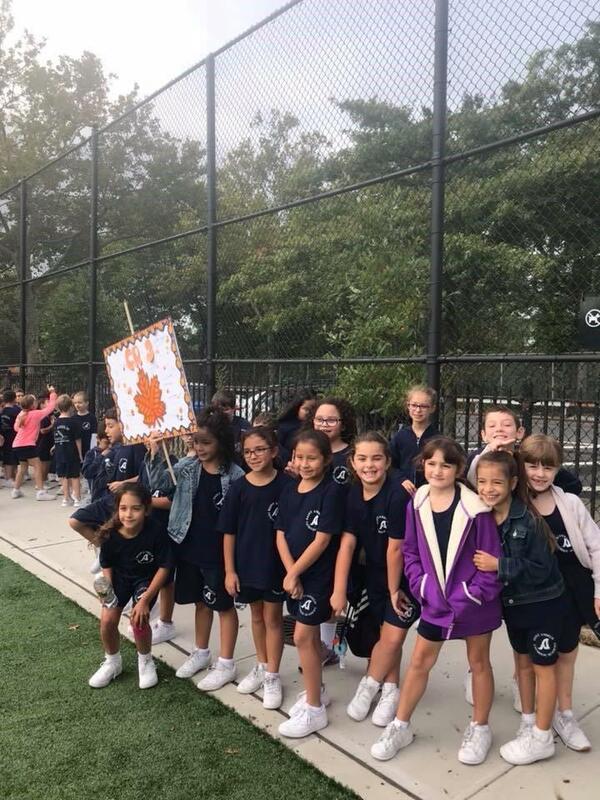 Students marched to the St. Anselm Field to show their school spirit and raise some dollars. 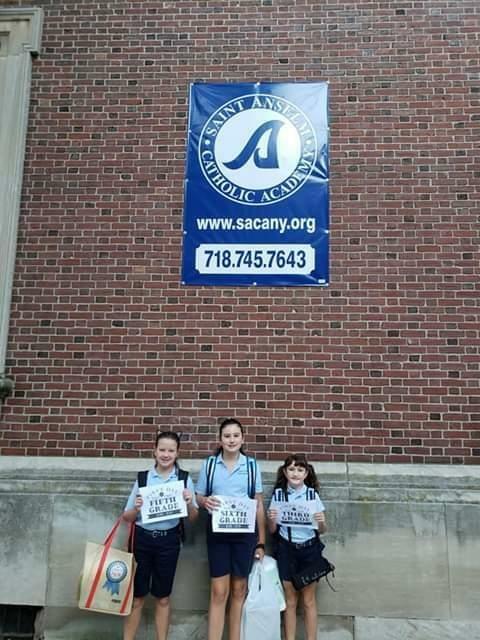 Our students proudly display their ACADEMY BANNER. The School Gym has a new floor . Thanks to all Volunteers and academy organizations who worked so hard to raise the funds and provided labor for the project. 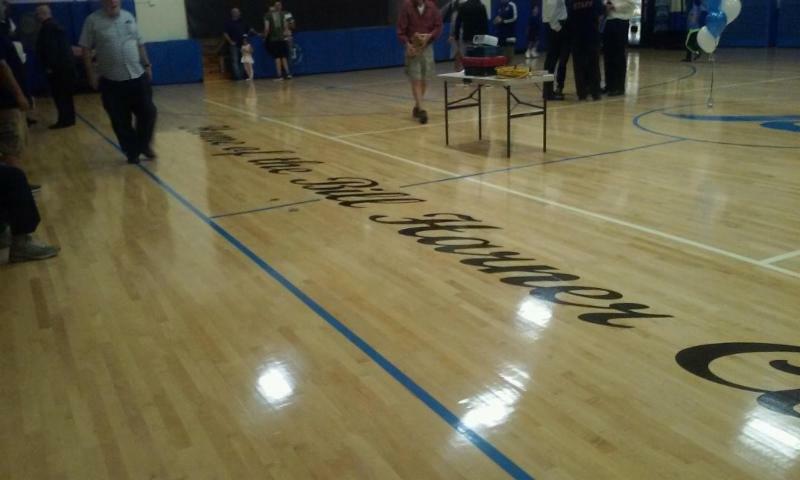 The new hardwood is dedicated to the memory of Mr. Bill Harner a long time volunteer and commissioner of our basketball program. Nomination form will be available soon. Xaverian , Fontbonne Hall, St Joseph Sea , Xavier , St Francis Prep , Notre Dame NYC , Bishop Kearney , Immaculate High CT. Graduates AGAIN have been awarded OVER $500K in SCHOLARSHIPS !!!!!!!! Everyone looked great in their uniforms. Msgr. Maloney blessed our BRAND NEW field. Then there were games, snacks and drinks and lots of fun for all! Catholic Schools Week 2018 ........... Please come visit !